This volume provides a new and nuanced appreciation of David Hume as a historian. Gone for good are the days when one can offhandedly assert, as R. G. Collingwood once did, that Hume “deserted philosophical studies in favour of historical” ones. History and philosophy are commensurate in Hume’s thought and works from the beginning to the end. Only by recognizing this can we begin to make sense of Hume’s canon as a whole and see clearly his many contributions to fields we now recognize as the distinct disciplines of history, philosophy, political science, economics, literature, religious studies, and much else besides. Casting their individual beams of light on various nooks and crannies of Hume’s historical thought and writing, the book’s contributors illuminate the whole in a way that would not be possible from the perspective of a single-authored study. Aside from the editor, the contributors are David Allan, M. A. Box, Timothy M. Costelloe, Roger L. Emerson, Jennifer Herdt, Philip Hicks, Douglas Long, Claudia M. Schmidt, Michael Silverthorne, Jeffrey M. Suderman, Mark R. M. Towsey, and F. L. van Holthoon. "The essays in this excellent volume tend to praise Hume's endeavours as a philosophical historian and historical philosopher. Nevertheless, a little more skepticism as to the limits of Hume's historical vision -- confined to Whig and Tory, and British and European perspectives -- would further elucidate Hume's strengths and weaknesses as a historical thinker." "All in all, this is a fine collection of essays, and the editor is to be commended for the selection and especially for the pairing of essays. The collection is a reminder for us of how famous Hume was as an historian and how admired his work was by many more than that Mr. Skiff of Hume, New York, and we get a nice overview, however brief, of the various topics the authors consider, certainly enough to encourage further research on the Histories." "David Hume: Historical Thinker, Historical Writer is a timely and wide-ranging reevaluation of a major facet of Hume's writing. This collection shows how 'Hume the historian' was evolving through his philosophical works and essays, both before and during the period of his great historical writing." "Hume the historian and Hume the philosopher are not distinct thinkers, and to understand the whole Hume, even the truer Hume, his thought must be understood comprehensively. Mark Spencer offers readers an invaluable book-length set of investigations to help us do just that. The volume therefore not only fills a rather massive lacuna in Hume scholarship by plumbing the philosophical depths of Hume the historian; it also rounds out and adds nuance to our understanding of Hume the philosopher." "A wide-ranging collection of new studies that cannot fail to be of interest to Hume scholars and students of historiography and eighteenth-century thought. The essays range from studies of the historical imagination, the limits of sympathy, and historical causation to essays on ecclesiastical history, medieval kingship, and the end of history to the reception of Hume's History of England in England and Scotland. The volume concludes with an erudite and engaging study of Hume on the populousness of ancient nations." "In his own day Hume was better known as an historian than as a philosopher. The opposite is the case today. This collection of eleven essays forwards the rebalancing of the study of Hume's thought as a whole, and helps to set out his true place in the history of ideas. 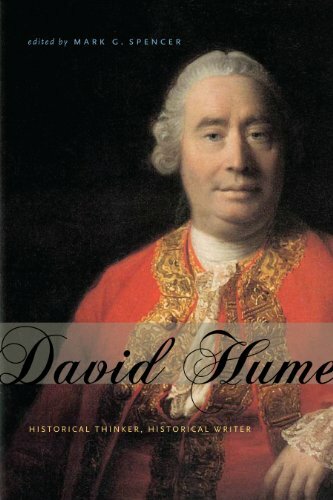 David Hume: Historical Thinker, Historical Writer will do much to nourish a holistic conception of Hume's thought." "Mark Spencer has performed a singular service for Hume studies by bringing together a distinguished group of experts to present their ideas on Hume the historian and his relations with Hume the philosopher. Collectively the contributors have produced a wide-ranging, carefully researched volume that argues convincingly for the inseparability of the roles of historian and philosopher in Hume. The book, full of acute observations and fresh argumentation, constitutes a highly persuasive reassessment of Hume's contribution to the Enlightenment." "Offering essays that consistently are of high quality, this collection is an excellent contribution to Hume scholarship." "David Hume was both a philosopher and a historian, and unlike some practitioners of the two crafts, his thinking in each area deeply influenced his thinking in the other. The chapters in this thought-provoking volume explore the mutual implications from many different angles. The upshot is a sense that in Hume's world all of philosophy and history take place within a history of human habit and custom, not Providence or Reason. But that does not mean that Hume is merely a 'conservative, ' as so many have said, nor that he was simply a supporter of the aristocracy. Rather, both his historical and his philosophical thinking were complex, critical, skeptical, occasionally contradictory, but ultimately profoundly illuminating and hopeful." 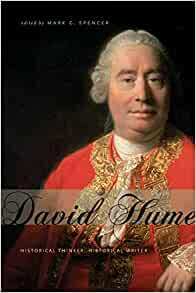 "In his own day David Hume was known above all as a historian, principally due to his multivolume History of England, a work which had a huge readership across Europe. Since then, however, his reputation as a historian has fallen by the wayside while his reputation as a philosopher has grown, to the extent that now he known as a philosopher and hardly at all as a historian. This interdisciplinary collection of original and highly persuasive essays offers a grand reassessment of Hume's overall achievement, first, by demonstrating that he had a brilliant historical imagination and, secondly, by showing both that his historical investigations were greatly aided by his use of philosophical instruments that he had fashioned and also that his philosophical investigations were aided by insights that he had acquired as a historian. The essays, taken collectively, point to the fact that Hume's thought had a remarkably rich unity that is bound to be missed by those who read only his overtly 'philosophical' writings. En route to these important conclusions attention is paid to such topics as Hume's concept of the role of sympathetic imagination in the construction of a historical narrative, to the broad hinterland of his idea of the 'spirit of liberty, ' and to the moral dimension of Hume's concept of the role of the historian. The book can hardly fail to set the agenda for much new thinking on Hume the philosopher-historian."